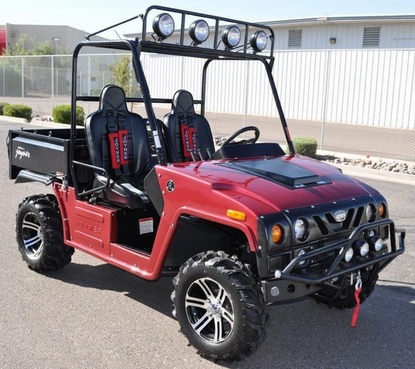 - UTV DOHC 1100cc - 72hp - 4-Cyclinder -Free Hard Top - Side By Side - FREE SHIPPING* Free Light Bar $399-value - Calif Legal Model! SUPER CLOSEOUT PRICE - LIMITED TO STOCK ON HAND! ACT FAST ON THESE BRAND NEW RENEGADE 4-CYCLINDER 1100 - 4 Seater! UNIT ARRIVES 100% ASSEMBLED. Limited to stock on hand! Very limited supply left! Brand New prior year closeout, with full factory warranty - LIMITED TO STOCK ON HAND! The Joyner is built for Xtreme Performance. Its the most powerful, fully featured Side by Side for working, playing and hunting in extreme conditions. 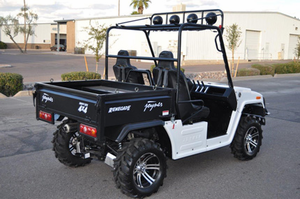 Joyner Has now unleashed its most performance-driven utility vehicles on the market. Built with the true outdoor adventure in mind, this lineup of Utility Vehicles is packed with advanced features that deliver the perfect balance between work and recreation. The Joyner models are the fastest and most powerful Joyner's ever produced. Designed for everyone who loves the outdoors for adventure or work, Joyner's do the job! Boasting 72 HP, it is the highest-powered engine in its class with superior low-end torque for taking on even the toughest work tasks, off-road trails, and the most rugged terrain. Horsepower is delivered by an 812cc Dual Overhead Cam Chery Engine, liquid cooled, inline 3-cylinder engine featuring 4 valves per cylinder, dual overhead cams and electronic fuel injection. The Renegade R-2 can travel at speeds up to 70 mph*. This is the fastest Renegade Joyner has ever built and is an example of the commitment Joyner has made to provide top-of-the-line, affordable UTV's. This Versatile Joyner Renegade "R2" Is Brand New Plus Comes Complete With Joyner USA's Six Month/Unlimited Mileage Factory Parts Warranty . Combine Big Bore/1100cc Power And Maximum Comfort With Joyner's Fully Independent Suspension Plus Performance Tuned Fuel Injection And You Have The Most Complete "Side-By-Side" Of All Time. * Top speed is estimated and your performance may vary. Length*Width*Height 127.16" X 61.02" x 74.80"
OFF ROAD: Joyner BUGGIES UTV and GO CARTS offer 6 MONTHS PARTS, 6 MONTHS ENGINE WARRANTY, MOTOBUYS.com will supply new or rebuilt replacement parts in exchange for defective parts for a period of 6(six) months, as well defective engines for a period of 6(six) months from the date of purchase at no charge. Buyers will need basic repair & basic setup skills such as using tools; replacing nuts & bolts, filters, light bulbs, fluids, adjustments, etc. 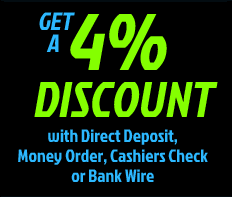 If you don�t have this ability we suggest using a mechanic to assist you with your needs. Our tech support Hotline is available to assist you. Labor is not included in this warranty.